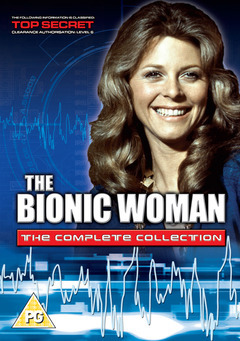 When tennis pro Jaime Sommers (Emmy Award winner* Lindsay Wagner), is critically injured in a skydiving accident, she is "rebuilt" using the government's top secret cybernetic replacement surgery known as "bionics". As the world's first bionic woman, Jaime is equipped with bionic legs capable of running over 60 miles-per-hour, a bionic arm that can lift an automobile, and a bionic ear that can detect the slightest of sounds. With her tennis career necessarily over, Jaime returns to her hometown of Ojai, California, to start life anew as a school teacher at a U.S. Air Force base. Between her classroom duties, Jaime moonlights as a secret agent for OSI Director Oscar Goldman (Richard Anderson), taking on highly-classified—and usually dangerous—missions, to satisfy a debt she feels is owed to the government for making her "whole" again. *1977 Emmy® Award winner for Outstanding Lead Actress In A Drama Series. All 58 episodes of the groundbreaking series, all digitally re-mastered and restored. Alan Crosland Jr., Phil Bondelli, Leo Penn, Jerry London, Mel Damski, Barry Crane, Michael Preece, Larry Stewart, Alan J. Levi, Kenneth Gilbert, Don McDougall, Ernest Pintoff, Tom Connors, Bruce L. Shurley, Jack Arnold, Gwen Arner, Ivan Dixon, Tom Blank.